On Saturday, high school junior Alexa Efraimson (Camas HS, WA) ran 9:00.16 to come in 4th place in the 3,000m at the 2014 University of Washington Invitational, breaking Mary Cain‘s 9:02.10 record which she ran at this track last year. The race included both professional and collegiate runners and was won by Oiselle’s Amanda Winslow in 8:56.37. We share a few quick thoughts on Efraimson’s extremely impressive run. Quick Thought #1: What an amazing year for Alexa Efraimson. She started her breakthrough year in cross country season where she won a collegiate 5K in 16:53 beating Boise State’s eventual NCAA runner-up Emma Bates and went on to win against a very competitive field at Nike Cross Nationals. Now in her first track race of the year she’s PRd by a ridiculous 31 seconds (previous best was 9:31.18) to take down a genuine Mary Cain record. QT#2: Efraimson’s 9:00.16 converts to approximately 9:43.21 for 2-miles and would put her second on the US junior list, behind the 9:38.68 Cain ran last year at the New Balance Grand Prix. Cain’s 2-mile was worth about an 8:55.82 3,000, so Cain’s 2-mile record is still better than Efraimson’s 3,000 mark. But Efraimson shouldn’t feel too bad about that as when Cain ran 9:38 last year we said hands down that it was the single best mark in US HS girl’s distance history. And Efraimson isn’t that far behind. As far as age goes, Cain was a high school junior and 16-years and 275-days old when she completed her 2-mile run. As of writing this, Efraimson is a junior and 16-years and 347-days old, so only marginally older than Cain was. QT#3: On February 15th Efraimson will go head-to-head with Cain and other professionals at the 2014 Millrose Games women’s Wanamaker Mile. 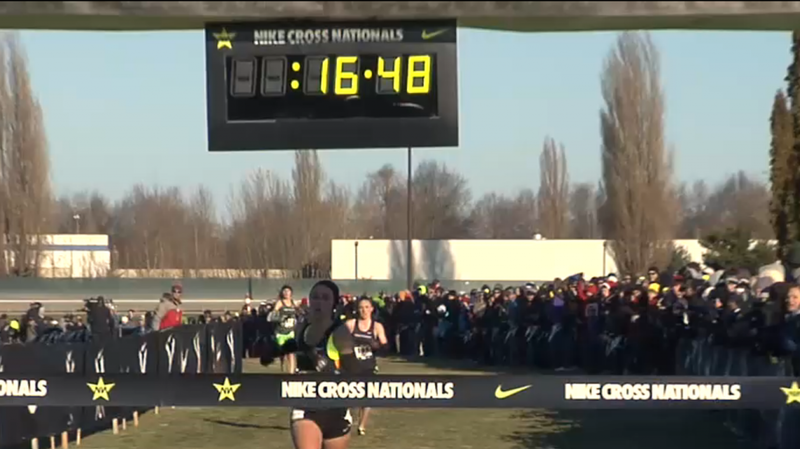 What was already a great matchup just got even more interesting in light of Efraimson’s 3K. We don’t expect Efraimson to beat Cain since Cain is a miler and Efraimson seems to do better at the longer distances (her 1,500 PR is 4:16.00 and 800 2:07.04 compared to Cain’s 4:04.62 and 1:59.51). However, it will be an exciting matchup nonetheless. QT#4: Efraimson’s 9:00.16 would make her the current NCAA leader by more than 4-seconds according to TFRRS.